Lonnie Johnson as a young man in the early 1920s. Like all bluesmen back then, Lonnie is dressed to the nines. I’ve just made a short film using a superb 1928 guitar duet as the soundtrack. It’s by Lonnie Johnson and jazz guitar pioneer Eddie Lang, who died prematurely five years later aged just 31. There’s more about Eddie in my book America’s Gift. Eddie Lang is playing rhythm guitar and the wonderful single string soloing over the top is Lonnie Johnson. Their pairing, I believe, was a seminal moment in American recording history, being the first time black and white musicians were recorded playing together. 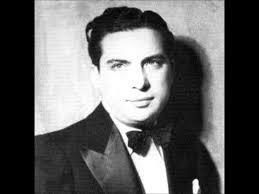 Blind Willie Dunn aka Eddie Lang. Eddie ended up as guitarist for his great friend, Bing Crosby. Not that hardly anyone knew this at the time, because Italian-American Eddie was recording under the black-sounding moniker, Blind Willie Dunn. In Europe, where racial segregation wasn’t an issue, he was credited as Eddie Lang. I chose to put a Lonnie Johnson track in the film because America’s Gift devotes an entire chapter to him, such was his contribution to blues’ development in my view. Lonnie may not have been the FIRST blues guitarist recorded playing improvised solos, note-by-note, on single strings, as is often claimed, but I do think of him as blues’ most influential guitarist and vocalist. Way back in 1927, Johnson pre-empted the modern guitar blues and rock solo on the then unreleased track, ‘6/88 Glide’, which you can hear below. An even earlier Lonnie Johnson track from 1926, ‘To Do This You Gotta Know How’, also features Lonnie playing and sustaining single notes. All through the roaring 1920s, Lonnie Johnson and Eddie Lang were considered by the U.S. music industry to be the most influential guitarists of the era. Lonnie was also the decade’s best-selling blues recording artist, after Blind Lemon Jefferson. One reason Lonnie surpassed Blind Lemon in influence may be that Jefferson died early, aged 36, while Johnson lived to 71. Lonnie Johnson, then, had more time on earth to exert his influence. Just a thought. 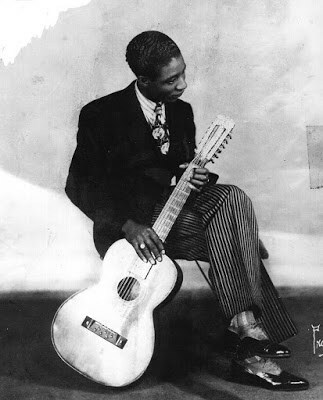 Lonnie Johnson’s revolutionary singing and playing styles (and not just his earlier records) served as phrasing and soloing templates used by everyone from Delta bluesmen to urban Chicago blues guitarists, paving the way for today’s modern blues style. 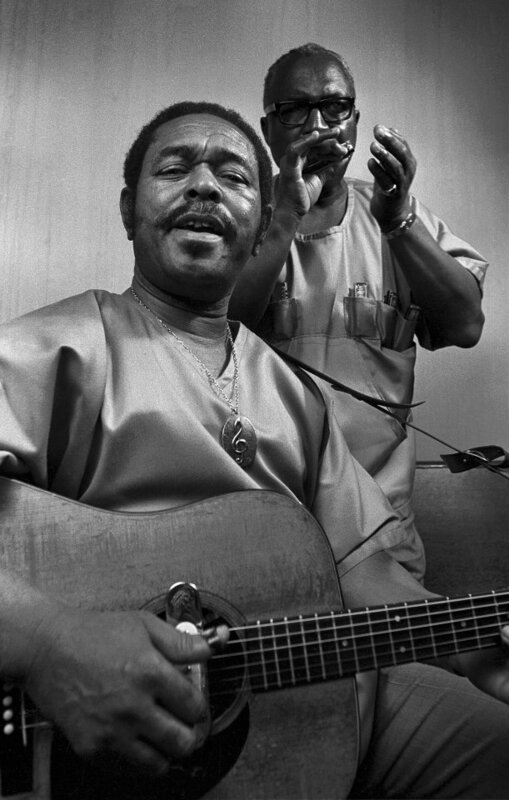 Brownie McGhee (foreground) said Lonnie Johnson’s work should be considered the blues bible. Today’s blues icon, Robert Johnson, worshipped Lonnie so much at the time, said bluesman Johnny Shines, he said was related to Lonnie Johnson (even though he wasn’t). Bob Dylan, writes some of Robert Johnson’s songs were new versions of Lonnie’s songs. Lonnie Johnson influenced both the city and the South. After the 1930s depression, wrote author James Sallis in his 1982 book, The Guitar Players, “Lonnie’s Johnson’s influence continued not only in the cities but also (and perhaps particularly) in the South, where the next generation of bluesmen avidly studied his distinctive guitar style, restrained vocals and the subtle interplay of the two. Just listen to Lonnie’s innovative blues guitar from this 1927 track, Dope head Blues, backing diva Victoria Spivey. That’s not her below, incidentally. It’s Barbara Stanwyk. Now, who remembers Barbara? “Lowell Fulson credits Johnson as a prominent influence in the development of his own style; T-Bone Walker stated that Lonnie and Scrapper Blackwell were far and away his favourite guitarists. In the 1930s, Johnson spent five years with Bluebird and Lester Melrose in Chicago, recording 34 blues tracks, including his race hits, ‘He’s A Jelly Roll Baker’, and ‘In Love Again’. For an example of Lonnie’s tasteful early electric guitar blues, check out ‘She’s Only A Woman’ below, recorded in Chicago in 1939. Even after five years laying down blues with Lester Melrose (See The White Guy Who Gave Us Chicago Blues – May archive) during WW2, Lonnie Johnson wasn’t finished. He had already taught the blues to George Barnes, the 16-year white electric guitar prodigy, who featured on many of Lester Melrose’s iconic pre-war Chicago blues recordings in the late 30s. As a measure of his versatility, Johnson had a number one hit in America as late as 1948, with his smooth crooning vocals and electric blues guitar fitting neatly into the West Coast Blues sound that would soon be called rhythm & blues. This was with ‘Tomorrow Night’, a track that spent six weeks atop the American race charts in 1948, and was later covered by Elvis Presley. More R&B hits followed. Lonnie, probably through financial necessity, was now playing a style of music far removed from his earlier blues and jazz. Why is Lonnie Johnson not a blues icon? Robert Johnson pretended he was related to Lonnie Johnson. Below is the film I’ve just made. Thought I’d better put it up before I forgot. Check out Lonnie’s pioneering single-string guitar playing in the soundtrack. Johnson, was introduced as Lonnie Donegan. Another version his it that Donegan was so impressed by Lonnie, he took the American’s name as his own. Whatever the truth, the name stuck and Lonnie Donegan always said he was honoured and proud to have it. Donegan, in turn, influenced a host of British rock bands from the Beatles and Queen, to the musicians who took blues back to white America like the Stones, Yardbirds, Fleetwood Mac and Led Zeppelin. In 1970, in poor health after being hit by an out-of-control car, Lonnie Johnson made a live appearance in Toronto with another blues legend Buddy Guy. It was his final show and he died soon afterwards, in Canada aged about 76. Paul Garon, a founding editor of the American magazine, ‘Living Blues’, complained bitterly of Lonnie’s relative obscurity in his magazine’s 1970 obituary for the blues great. Garon blamed the blues researchers who, “involved themselves exclusively with pre-war rural singers and post-war urban ones”. 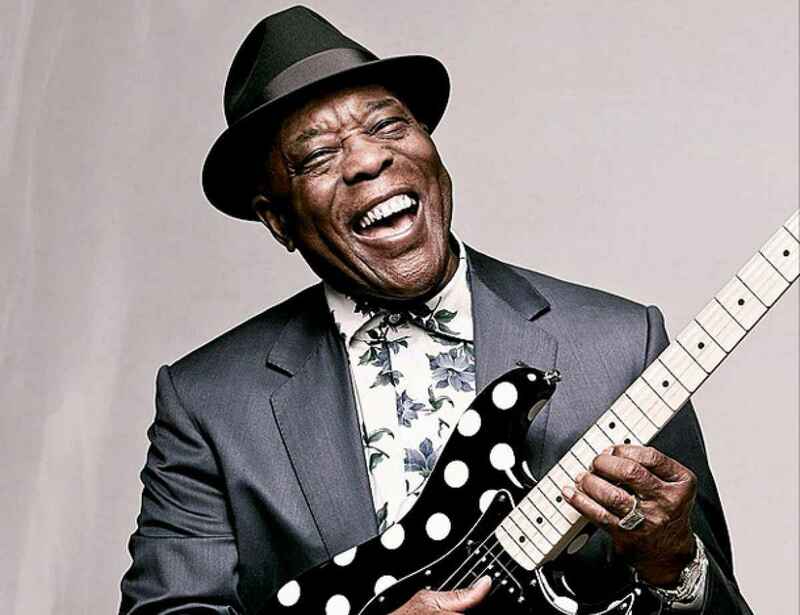 Buddy Guy was the last person Lonnie Johnson shared a stage with. Johnson died soon after, in 1970.